Often I am not sure how other photographers feel about my use of Snapart3 on my photographs, and I guess the reality is if I like it and it pleases me, then who cares, but I think we all like a little reassurance that we are not all wet with our thoughts and images...so I asked on FB the other night and photographers I admire, said they liked this image...but one comment got me to thinking (a dangerous thing). The comment went like this......."I know a few, politely labeled purists, who have heartburn over it." The comment made me think....."but I didn't like the photograph from a purely photographic perspective." So today, I thought I would share my ideas, process and a few before and after images. 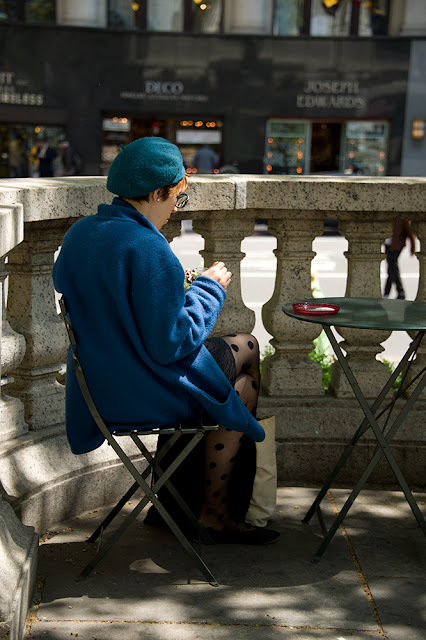 When I saw this young woman, sitting in dappled shade on a sunny spring day in front of the New York library, I just loved her style; from the Polka Dot stockings, to the blue beret, wire glasses and blue draped coat....I also loved the scene, with the bistro tables, old architecture and urban backdrop. So I made the shot. What I did't like was the fact that she was eating lunch. I never really like to catch people eating as I just don't think those are great shots, but I was moving fast and had only a few seconds to capture the scene. I made two shots...the shot below is the one I decided to work with. Now for me, as a photograph, I don't like it! While it is a "pure" representation of the scene. Pure ~ Although, one might argue that, as I was working with a shallow depth of field around 3.6, which then blurs the background...so whats pure? I didn't like the amount of contrast with the background lights on the buildings, I didn't like the bright street light coming through the balustrades. I didn't like the person caught in the balustrades walking across the street. I didn't like the pills of wool on her beret. But I thought I could do something with it when processing...as I liked the subject and the scene overall, just not how the camera rendered the light and detail. So I went about applying my vision for the scene. First, in Camera raw and Photoshop I took a lot of contrast out of the scene and adjusted colors, But it still wasn't working for me....but it was getting closer to my vision. I opened up the shadows so her stockings were more visible which then revealed a large run in her stocking at her heel..... the background lights also became less distracting, a good thing. At this point I said lets run it through a little Snapart3...as I really did see this as a French impressionist inspired image. When I did, I used several layers to apply different styles of "paint effect" to different parts of the image. 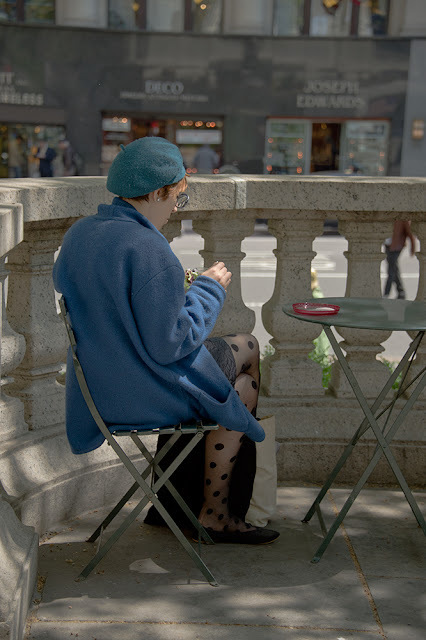 After working the image in Snapart3 you really can't tell she is eating, the pills in her beret disappeared, the run in her stocking is gone, the people seen through the balustrade I now liked giving the scene a sense of place. In the end after processing, I really did have the image I was seeing in my mind when I made the shot. If I was working in the "purist" mindset, I probably would have thrown the image out! I don't know what I will ever do with it, but artists paint because they love to paint! I process pictures because I love to process pictures! and I probably would paint if it didn't involve all the that mess, supplies and storage of supplies. Plus I like the act of photographing! Everyone has different vision and I for one am glad for that, it expands mine and makes me think! Thats what I love about photography and technology....your mind sees it and even though the light or the setting isn't just right you can create it....and make it yours. I agree so much to work with now it's just great to have these creative tools!